A 4 year investigation into South Africa's rhino poaching crisis involved going against some of the most nasty criminal networks. And alongside the rangers in South Africa’s rhino sanctuaries the filmmakers move directly into the firing line. Then to Asia where Stroop asks whether there's any basis to the horn's popularity as a cancer cure? This epic investigation exposes a unique panorama of the global trade in rhino horn. “I just opened the door and that’s when I saw these five guys holding the girls and with the weapon facing me…I knew they didn’t come for us. I knew they come for the rhino.” Axel Tarifa was tending to the baby rhinos at the Thula Thula Rhino Orphanage, South Africa, when armed men stormed the property. They held the staff hostage and then shot two 18-month-old white rhinos, Impy and Gugu, before brutally removing their horns. The deaths of Impy and Gugu are far from isolated incidents: in the past decade, rhino poaching has exploded, stoked by demand in Southeast Asia, where rhino horn doubles as a traditional medicine and as a prized component of high-end jewellery and ornaments. Worth more than its weight in gold, the demand for the horn has decimated the animal’s numbers, with fewer than 30,000 left in the world. In South Africa’s national parks, rangers, pilots and K9 units fight what one ranger describes as “a low intensity war” against poachers. In the hardest hit area of Hluhluwe-Imfolozi Park, a unit of 20 rangers is expected to cover an area three times the size of Paris. Working against increasingly sophisticated and organised adversaries, they have their work cut out. “He’s always at the advantage, he’s choosing where to go, you have to follow”, says one ranger describing the uphill battle to defeat the poachers. 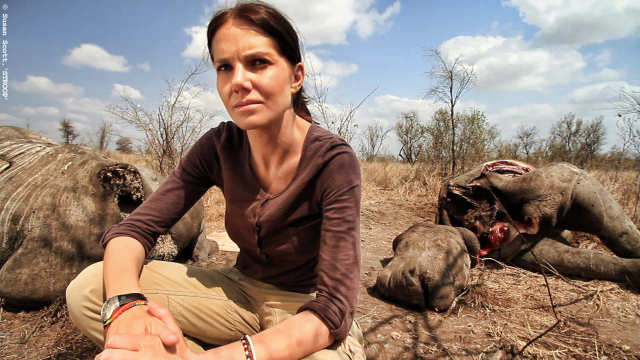 Bonné de Bod discusses unravelling the rhino horn industry here. For an interview with filmmakers Bonné de Bod and Susan Scott, see here. 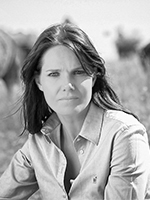 Bonné is well known as an award winning wildlife television presenter. She has been on South Africa’s popular wildlife and environment programme 50|50 for seven seasons and is a special correspondent for SABC's Newsroom. Her series Rhino Blog is on DSTV's People's Weather where it is currently ranked the most popular show, and she has also been awarded the prestigious Kudu Award for Best Journalist. Her in-depth knowledge on the rhino poaching crisis from four years filming on the ground and doing undercover work in Asia has led to Bonné facilitating discussions on illegal wildlife trafficking for the United Nations Environmental Programme as well as talks on radio, at film festivals and wildlife symposiums. 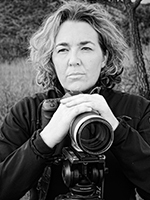 Susan Scott is a filmmaker in Johannesburg, South Africa where she produces stories on wildlife issues for various broadcasters around the world. Prior to her directing work, she was a film editor for 17-years cutting for some of the best wildlife filmmakers on the planet. Awarded the prestigious acronym from the editors guild of South Africa, Susan has gone on to win several awards for her work, among them 3 SAFTAs, a Jackson Hole Wildlife Film Festival award as well as winning at the SAB Environmentalist of the Year for her writing and photography. 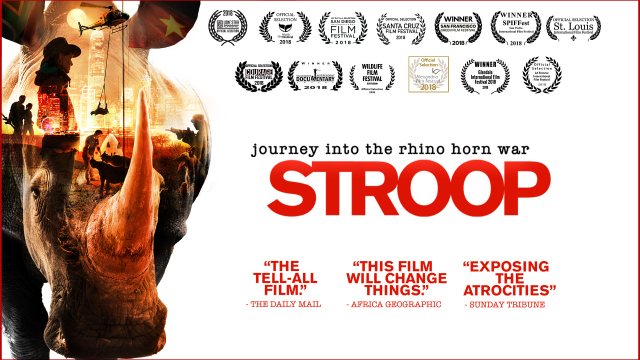 In making this film about the rhino poaching crisis, I initially thought it would be all about the rhinos, but it’s actually become about the people around the animal. Those whose lives have been irrevocably changed because of conditions brought about... not ecological management or natural events... but wholly due to anthropogenic activities. So while the animal, the rhino, is the basis for the story, the structure of the film is interwoven between us - the filmmakers as well as the key characters who help us understand the gravity of the situation and how rhino poaching is impacting human lives. I do think the fact that we were women helped immensely! We were trusted easily and many times in filming in sensitive locations with nervous characters, it was just myself behind camera and then Bonné with the character/s. Bonné is well known as a credible wildlife presenter/journalist in South Africa, so the two of us were able to get the intimate moments we needed to tell this never before seen story.